My wife’s friend Khun Nong cleaned out a storage unit today. Khun Nong is Thai Muslim, so these statuettes of Pra Pi Ganesh, Ganesha, and the Chinese prosperity icon were just decorative for her. Khun Nong is an observant Muslim, she taught me a lot about Islam, and she made me recalibrate my thinking on that faith, as my previous experiences with Muslims were with jihadis and proto-jihadis, Sunni Wahhabis, Salafis in love with a cult of death, anticipating their 72 virgins. Thai Muslims, the ones that I know, are deeply peaceful, carefully observant of their rituals and charitable activities in their communities. They live without friction in a Buddhist country, there is no conflict in Bangkok between Thai Muslims and Buddhists. Just do not ask them about Israel. My wife was surprised to hear invective and condemnation about Jerusalem and the Al Aqsa Mosque at a Muslim fair. When I explained that Israelis defeated Arab armies and yet respected the sanctity of Al Aqsa, she was impressed. I think that the Jews should build the Third Temple. I do not go to the Thai South, where a Muslim separatist war has raged now for decades. The last king, His Majesty King Rama 9, was a nationalist and he dismissed proposals for limited autonomy for Southern Muslims, who once had their own Pattani kingdom until it was conquered by modern Thailand. Thailand is a melange of religions and mythologies, it was in its distant past an animist region. Then the Hindu came with their innumerable gods and goddesses, and their depictions of Vishnu, Brahma, and Ganesh. I see few depictions here of Shiva, and very few of Kali Ma. 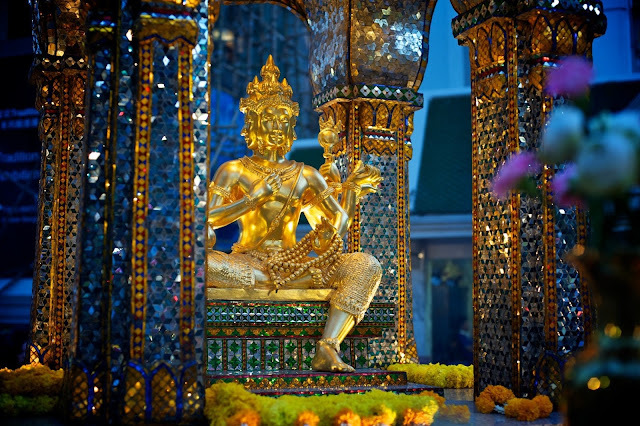 Phra Phrom, the Brahma idol at the Erawan Shrine next to the Grand Hyatt Erawan Hotel at Ratchaprasong. This idol is at the heart of the great city. After the Hindu came the Buddhists. The Buddhists came last, so their syncretic layer is strongest, though you still see manifestations of the Hindu gods and animist rites persist. China is near, but not too near, so you also see Chinese influences, brought by Chinese migrants who came south and settled in Thailand. When I ask my wife about Chinese iconography, she tells me “I am Thai so do not ask me.” Thai Chinese have their own myths and their own iconography, and it surrounds us, along with all the other influences. I always found it interesting that Chinese merchants can erect their shrines on the ground in their businesses, while Thai depictions of the Buddha must always be elevated, the highest objects in a structure. My wife has a spirit house at her father’s house in Buri Ram, and when she is there she assumes the daily duties of replenishing the offerings. We do not own our home in Bangkok, we rent, so she has no spirit house here. Our ancestors are not here, except in our hearts. 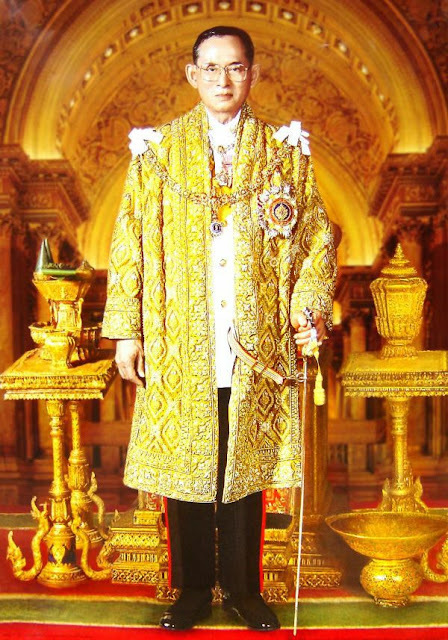 She does have a shrine inside our home, with Buddhist icons and depictions of His Majesty King Rama 9, and some eminent monks. I help her keep the flowers fresh there, she burns incense and prays on Buddhist holy days, and peace reigns in our household, except that Her Majesty my cat does not like the incense. Her Majesty comes to my office and she complains, loudly saying “meow! Mommy is burning incense again!” She sits in my doorway like a little ruler of the household, and the tone of her “meow!” Is clear: do something about that incense! Her Majesty in her front garden. She does not like incense! I asked my wife what Khun Nong would have done with these statuettes if she had not been there to inherit them, and she said that Khun Nong would have donated them to charity. Of course. Graven images are haram in Islam. I am glad that they came to us. I am not sure where Momma will put them. Perhaps with the other icons. Except the Chinese prosperity statuette. I do not know where she will put that. She is not Chinese. I am ignorant of the mythology behind this icon. 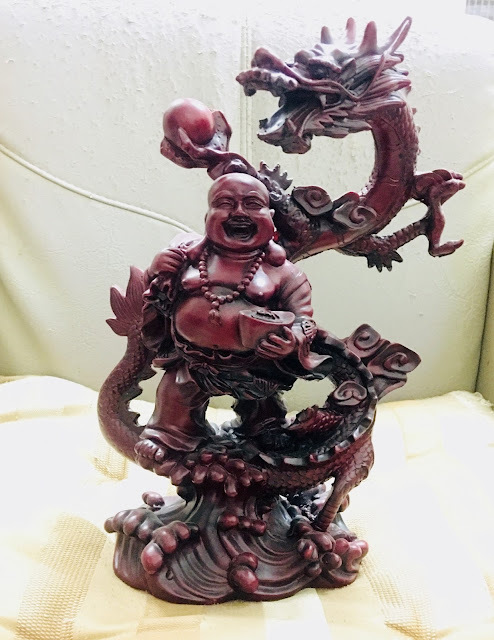 I presume that it is a prosperity icon, and that the smiling man stole treasure from the dragon. If you know about this icon, please enlighten me in the comments! Thank you. We are also conflicted about the golden depiction of Pra Pi Ganesh. We are disturbed by his eyes. These are just everyday statuettes, not limited editions by eminent artists. You can buy them in street markets. 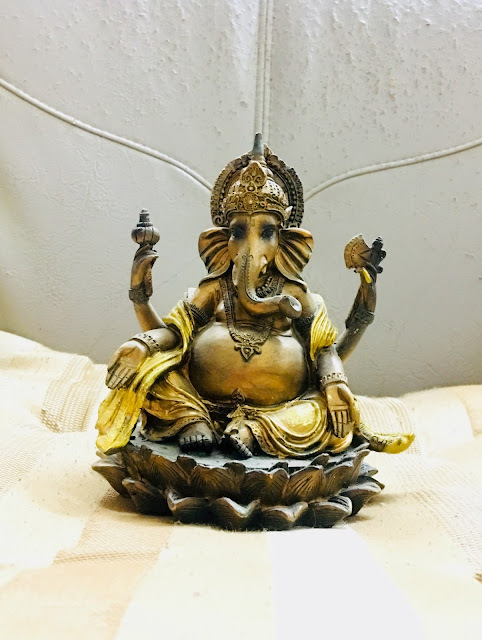 But their attention to detail is remarkable, and the artisan who made the golden icon of Pra Pi Ganesh achieved something when he carved the eyes. As I say: the eyes of this idol are perturbing.